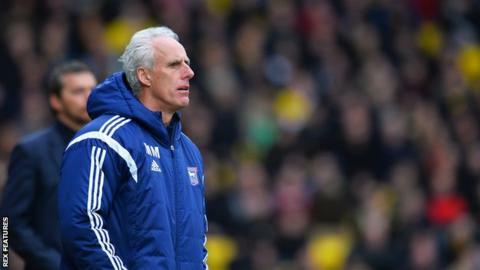 Ipswich Town boss Mick McCarthy expects a tough test from Charlton in Tuesday's Championship game at Portman Road. The Addicks' Jorge Teixeira struck a vital late winner against Birmingham on Saturday despite a fan protest against club owner Roland Duchatelet. "Despite everything going on, the team and manager are still a really tough unit," McCarthy told BBC Radio Suffolk. "I'm kind of pleased they won. They're not coming back where they need a reaction," he added. Jose Riga's Charlton arrive in East Anglia in good form, having picked up 10 points from their last five fixtures. Ipswich on the other hand have seen a reversal in fortunes. Having won only one of their last five games, the club sit five points off the play-offs. "I've looked at some of the fixtures and we've got Derby, Middlesbrough and Sheffield Wednesday," McCarthy added. "I thought 'well all the fixtures are tough games, we've all got them'. Quite a few of us have got to play each other." Despite Charlton's 2-1 win over Blues, they remain six points from safety in 23rd after Fulham defeated MK Dons. "Let me tell you they (Charlton) haven't been a closed book," said McCarthy. "When they have got the ball they have been quite expansive, but when they lose it they get back and defend their half. "It will be great if it turns out to be an open game, but I'm not sure that will be the case."